But when you find something you like, that your kid likes, and that is so easy to work with, you just kind of stick with it. And it's really easy to come up with things that go well with a white fish like cod. This one happened to be blood oranges. I'm always so excited when blood orange season comes around. Have you ever had one? They're amazing! They're essentially just an orange with a floral tone, but it's such a unique flavor and it's nice for a citrusy change of pace. I highly recommend giving them a try if you haven't. I normally just like to eat them plain, but I've used them in other things such as a martini and a soon to be salad dressing. I was curious about using them in a different kind of dish though. 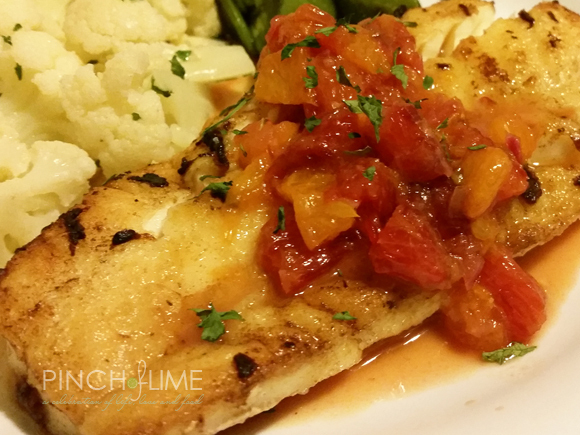 Enter the blood orange sauce for the fish. Because...why not! 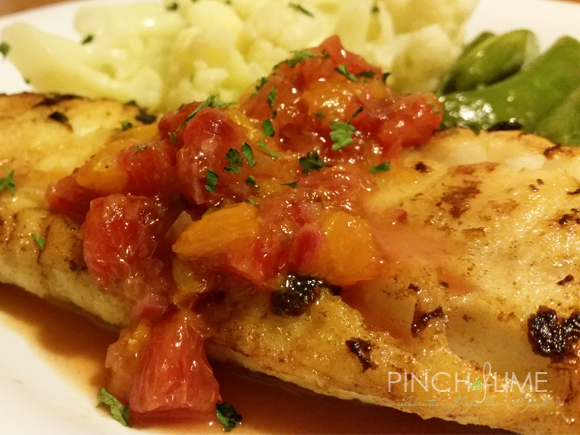 The sauce had a little sweetness that offset the fish beautifully. It would probably pair nicely with other white fish as well. I really enjoyed this dish and will definitely be making it again before the blood oranges leave the grocery store! 1. Supreme oranges: To do this, first cut off the top and bottom off of each orange. Next, cut around the curve of the orange to cut away the peel and pith, exposing the pulp. Next, you'll cut between each section's membrane to cut away the pulp section. Chop pulp sections and set aside in a bowl. Combine orange juice, sugar, vinegar, lemon juice, and salt in another bowl and set aside. 3. In same pan, add onion and cook for about 30 seconds. Add orange juice mixture and bring to a boil. Continue boiling for about 2-4 minutes or until reduced by half and slightly thickened. Add chopped oranges and stir well. Bring back to boil and cook until oranges are softened, about 1 minute. Remove from heat and serve over fish.